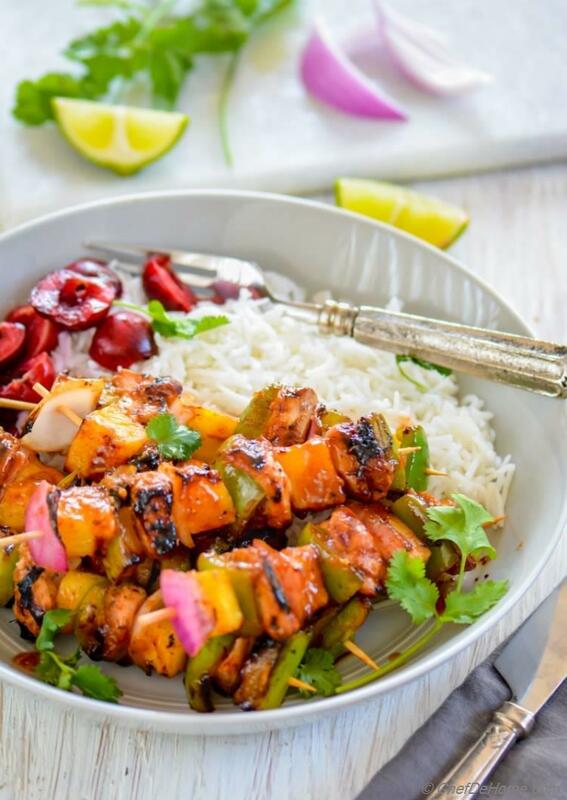 Sweet and Sour Hawaiian Chicken Skewers served with side of seasoned rice for a flavorful summer weekday dinner or weekend BBQ!! 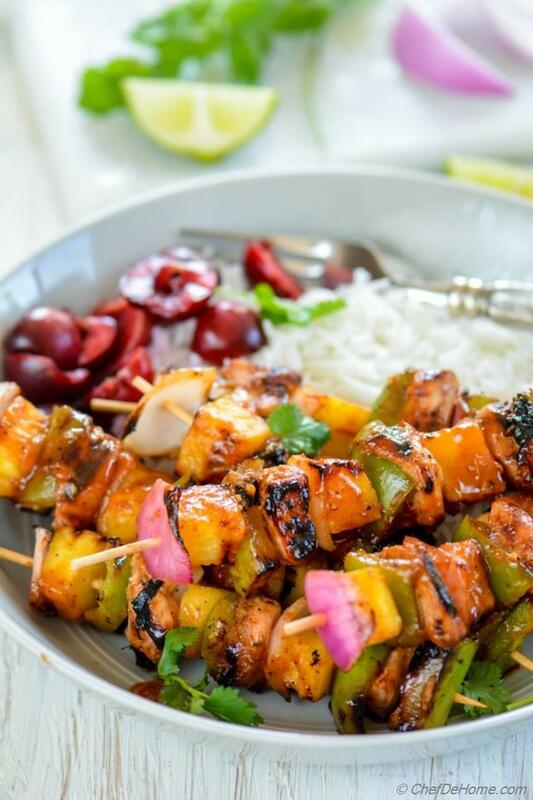 Grilled Hawaiian Chicken Skewers - Sweet, sour, pleasantly spicy Hawaiian sauce marinated chicken skewers (kabobs) with slices of juicy sweet pineapple, red onion, and bell pepper! To me this means, happy summer grilling days with chicken skewers sizzling on the grill, a glass of favorite drink in hand.... and chit-chat with friends and family!! A perfect way to spend weekend evening! Isn't it? Since long weekend of 4th of July is here.... 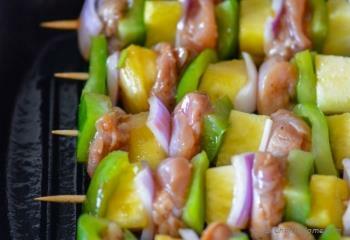 I thought it will be best to share with you an easy and juicy grilled chicken skewers recipe. 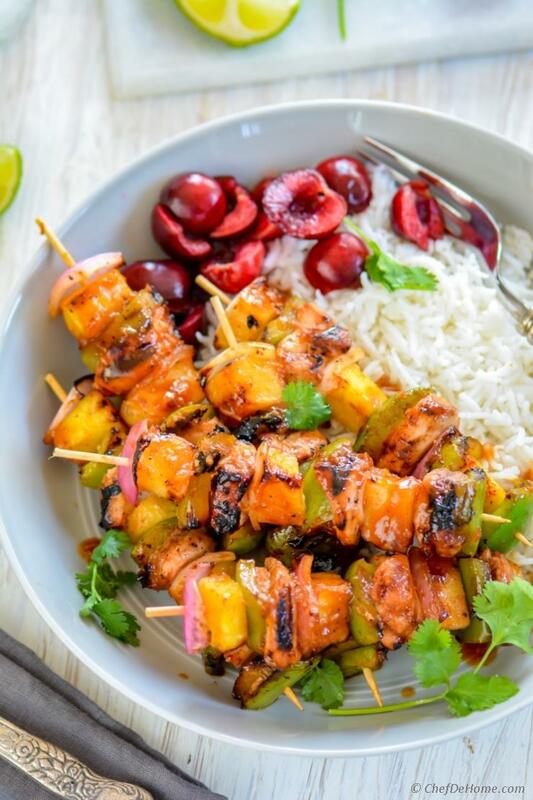 This Hawaiian Chicken marinade is so flavorful and makes chicken so juicy, sweet & sour that everyone in gathering would reach for few skewers. The sweetness of pineapple, agave, when combined with lite tamari soy sauce, nutty sesame oil and tangy ketchup... it gives chicken that sweet and sour BBQ chicken flavor... and zippy looks makes party-platter look so eye-catchy! What I like the most about this Hawaiian Chicken? 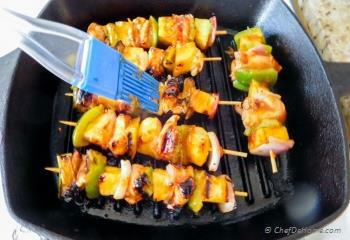 On the grill, chicken skewers take 2-3 minute each side. I always make sure to fully cook chicken from all sides and keep basting chicken with leftover Hawaiian sauce/marinade. This adds another layer of flavor. 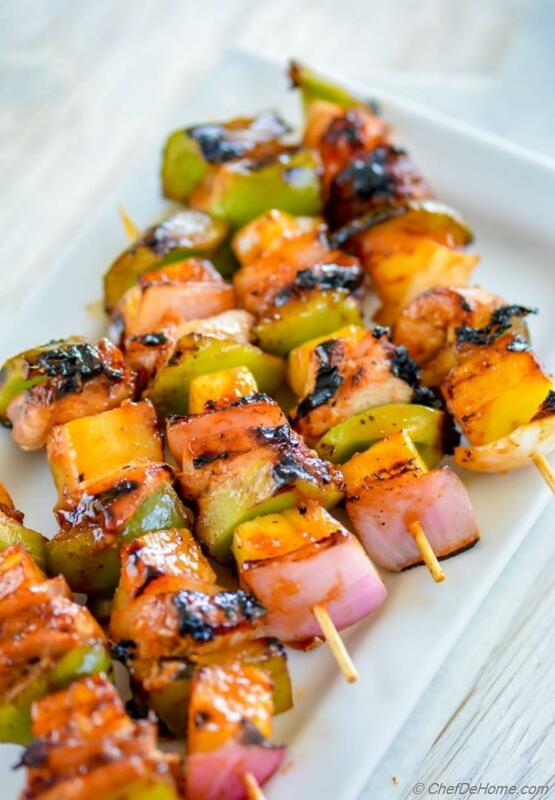 By the time chicken is ready, veggies pick-up char grilled flavor from grill, sweet pineapple pieces are caramelized, and glazed in Hawaiian flavors! So so good! Grilled, sweet and sour juicy pineapple is always a treat! I served Hawaiian Chicken with side rice and simple cherry salad for dinner last weekend! Rice are seasoned with some sesame oil, lemon juice and salt. Salad is simple pitted cherries. These were so sweet and juicy that I felt need of nothing else. 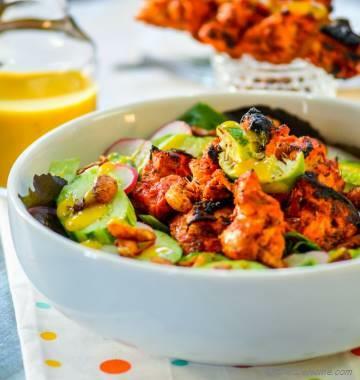 For a 4th of July party platter, you can also serve Hawaiian Chicken Skewers with a vibrant summer salad and drink. I have listed few ideas in suggestion below. PS: I missed you guys on Wednesday this week due to some unforeseen reason. Happy to be back just before 4th of July weekend and so glad to share this delicious recipe with you. Enjoy long weekend and please be safe while near fireworks!! Don't forget to share with me - what's your favorite grilling recipe idea for 4th of July? A delicious 4th of July menu for weekend gathering! Enjoy! 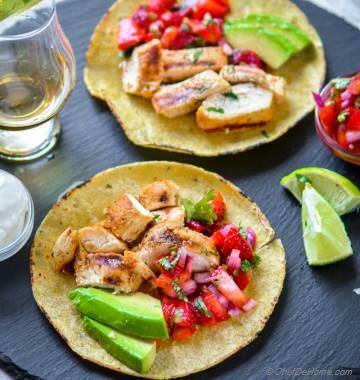 Smart Swap Replace chicken with fish such as Cod or Salmon for delicious seafood skewers! 1. 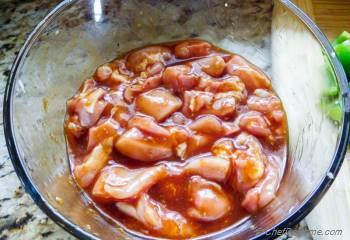 Mix Hawaiian Chicken Marinade in a bowl, add cubed chicken and let is marinate for 30 minutes to overnight. 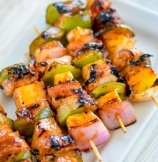 If using wooden skewers, soak in water to avoid burning on the grill. 2. 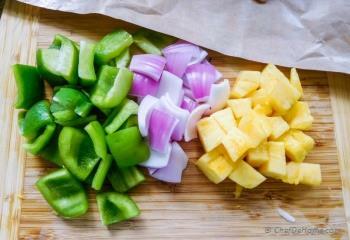 Slice and dice veggies and set aside. 3. Set iron griddle or gas grill to preheat. 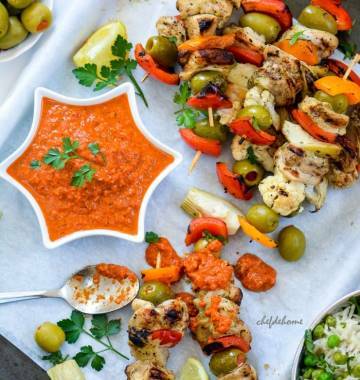 Skew chicken and veggies on metal or wooden skewers with threading chicken and veggies in alternate fashion. Place skewers on medium heat grill. 4. Cook 2-3 minutes each side until chicken is cooked from all sides and is caramelized. Brush remaining marinade over chicken once or twice for more caramelized color and flavor. 5. 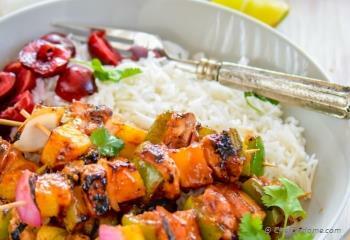 Serve skewers with side of rice for main course or slaw and grilled bread for bbq party. Enjoy!